LindaThiemann ... Fine Art Created with Fiber - "Tidal Surge"
Felted roving was used to make the entire piece which was then stretched on a gallery-wrapped canvas. 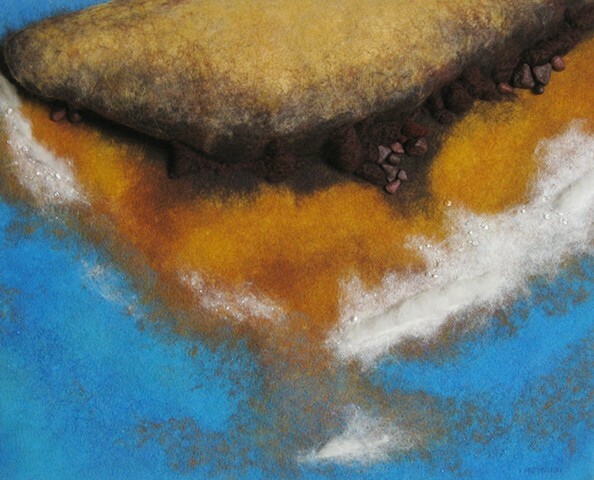 The top area of the piece is actually a felted form that stands out several inches from the surface of the piece, and some of the felting (part of the white area) is left to rise out of the surface felting. The base of the cliff area is also enhanced with handmade yarn and polymer clay rocks. Beading also adds extra embellishment to this piece which depicts the drama of the sea.